A CM who is in an acclimated state remains in an acclimated state as long as they remain within a zone +/-2 hours either side of the time zone in which the CM is acclimated to. (D) Acclimated to Departure – occurs when a CM has spent sufficient time within a time zone to become acclimated to the time zone for departure. (B) Acclimated to Previous Acclimated Time Zone – occurs when a CM has spent insufficient time within a time zone to begin the acclimatization process. (X) Unknown – when a CM has entered a new time zone and has begun the acclimatisation process but has not spent sufficient time to adjust to the local time zone. 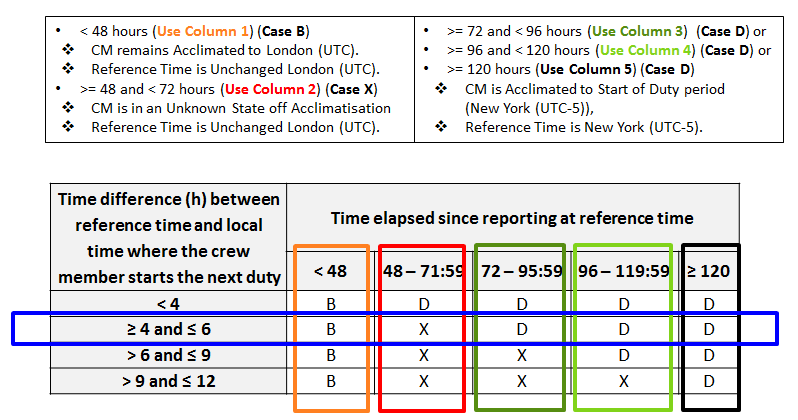 Example: a CM acclimated to Paris (UTC + 1), remains acclimated as long as they remain within the following time zones: UTC -1, UTC, UTC + 1, UTC + 2, UTC + 3 at the conclusion of the duty period. 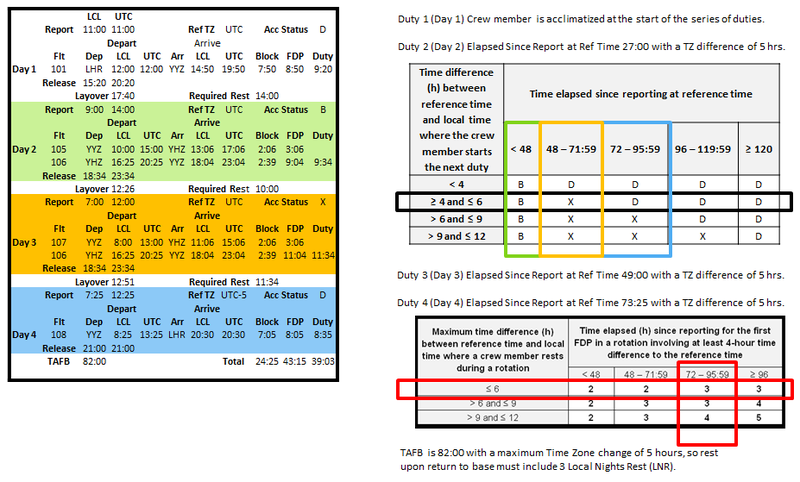 Jeddah (UTC + 3) is acclimated, while Tehran (UTC + 3:30) will require the crewmember to become acclimated. Acclimatisation process is also known as re-adaptation. Flying across time zones exposes the circadian body clock to sudden shifts in the day/night cycle. Because of its sensitivity to light and (to a lesser extent) social time cues, the circadian body clock will eventually adapt to a new time zone. 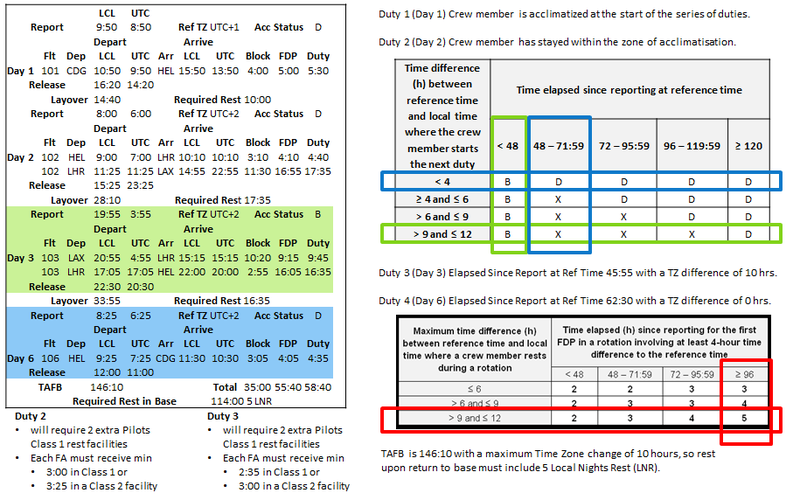 Table 1 is to be applied when a CM has exited the zone +/- 2 hours from the previous reference time. 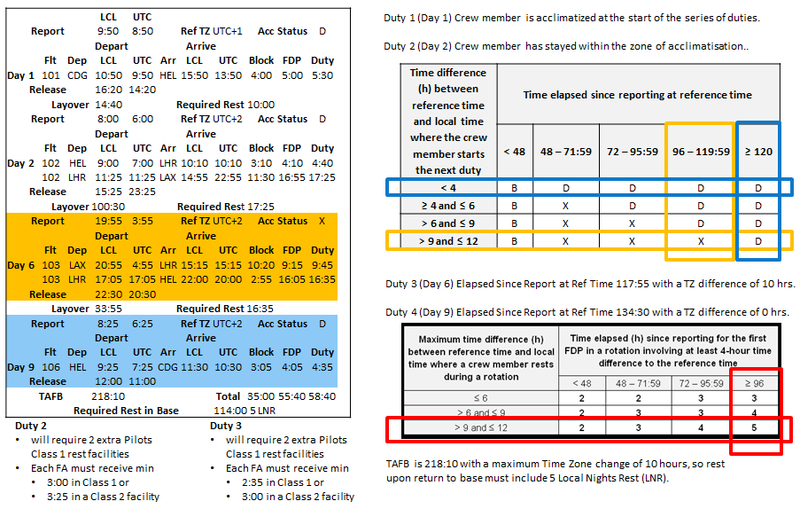 Time difference between reference time zone and local time, is simply the difference between the time zone where the CM was last acclimated to, and the time zone where a crewmember will begin the next duty. Example: CM is acclimated to Paris (UTC + 1) (Reference Time) and will begin the next duty period in Chicago (UTC -6), whereby the Time Difference is 7:00. The time elapsed since reporting at reference time to the time of report of the next duty. A conversion to UTC date time will be required to calculate the elapsed time. A Report in Paris on 15-Feb-2017 at 10:00 (Local) is 15-Feb-2017 at 09:00 (UTC), the next report in Chicago is on 16-Feb-2017 at 20:00 (Local) is 17-Feb-2017 at 02:00 (UTC), whereby the time elapsed is 40:00. 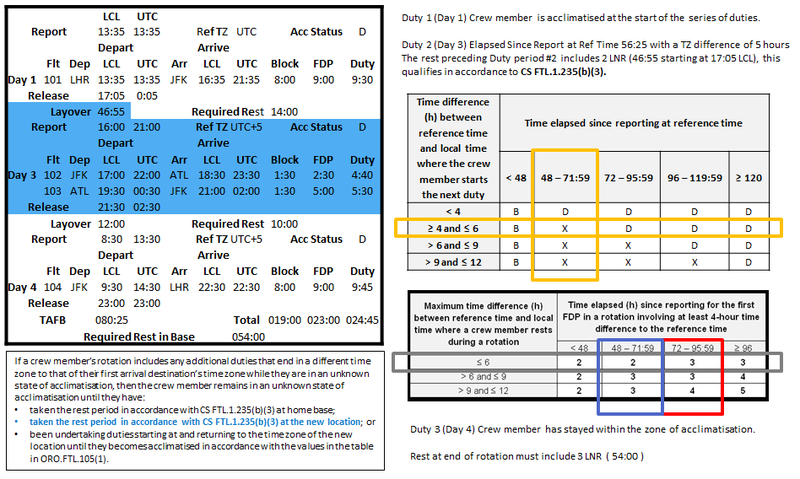 Case #1: Since the elapsed time is less than 48:00 (Row 3, Column 1) the crewmember remains acclimated to Paris time (UTC + 1). Case #2: Had the departure in Chicago been postponed 24 hours, the elapsed time would be 64:00, the CM has now moved into an unknown state of acclimatization (x) (Row 3, Column 2). Case #3: Had the departure in Chicago been postponed 60 hours, the elapsed time would be 100:00, the CM has now moved into an acclimated state of acclimatization (Row 3, Column 4). The CM is acclimated to Chicago Time (UTC -6). When a CM begins the next duty period in an (B) Acclimated to Previous Acclimated Time Zone state to the reference time is the time zone where that cm was last acclimated to. When a CM begins the next duty period in an (X) Unknown state there is no reference time. 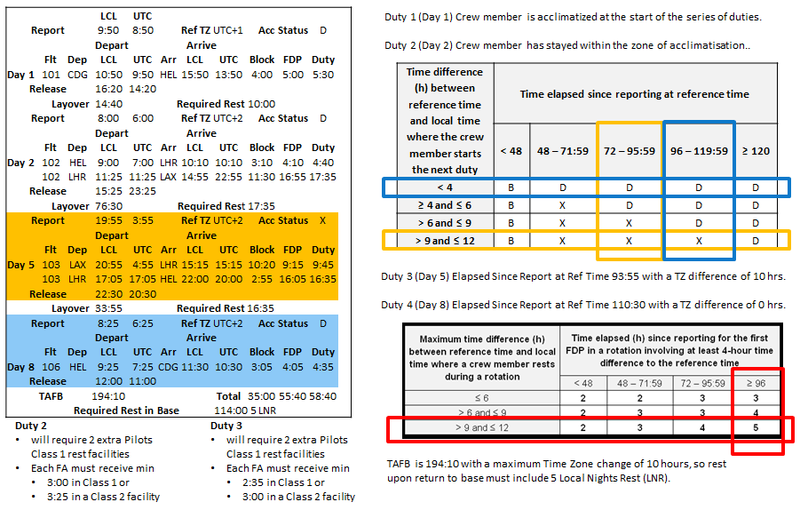 When a CM begins the next duty period in an (D) Acclimated to Departure state the reference time is the local time zone where the duty period begins. Should the CM remain within the zone of acclimatisation, the reference time is the local time zone where the duty period begins. A CM starts a series of duty periods in an Acclimated state in Paris (UTC+1). The CM will be considered Acclimated to the next Duty period as long as it is within the following time zones (UTC-1, UTC, UTC+1, UTC+2,UTC+3). The Duty ends in Helsinki (UTC+2). The Reference time is Paris (UTC+1). The CM is considered acclimate at the start of the duty period (UTC+2). The CM will be considered Acclimated to the next Duty period as long as it is within the following time zones (UTC, UTC+1, UTC+2,UTC+3, UTC+4). The Duty ends in the duty ends in London (UTC). 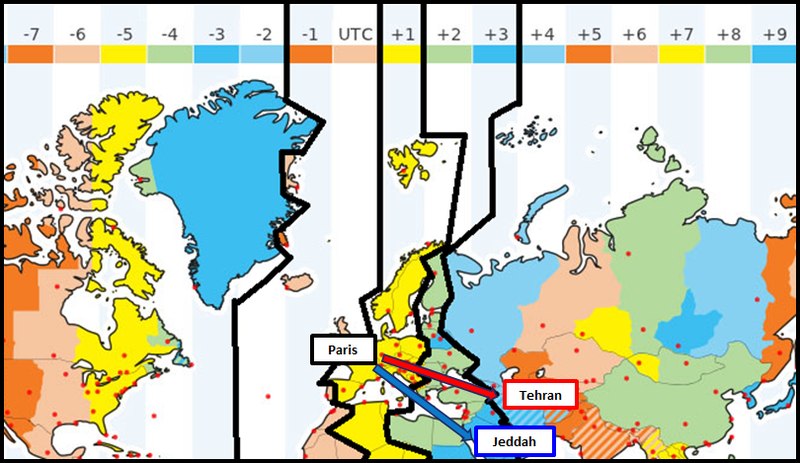 The Reference time is now considered to be Helsinki (UTC+2). The CM is considered acclimate at the start of the duty period (UTC). The CM will be considered Acclimated to the next Duty period as long as it is within the following time zones (UTC-2, UTC-1, UTC, UTC+1,UTC+2). The duty ends in New York (UTC-5). The Reference time is now considered to be London (UTC). Time elapsed since reporting at reference time = Report Time Duty 4 – Report Time Duty 3. The CM is considered acclimate at the start of the duty period. The duty ends in London(UTC). The Reference time is Still considered to be London (UTC). Duty 5 will be considered acclimated. The CM is considered acclimate at the start of the duty period (UTC-5). The CM will be considered Acclimated to the next Duty period as long as it is within the following time zones (UTC-7, UTC-6, UTC-5, UTC-4,UTC-3). The Reference time is Now considered to be New York(UTC-5). Duty 5 will need to follow the same process as duty 4. The CM is considered to be in an Unknown state of acclimatisation at the start of the duty period . The duty ends in Helsinki(UTC+2). Duty 6 will be considered acclimated. The Reference time is Still considered to be same reference time as Duty 4. Duty 6 will need to follow the same process as duty 4. 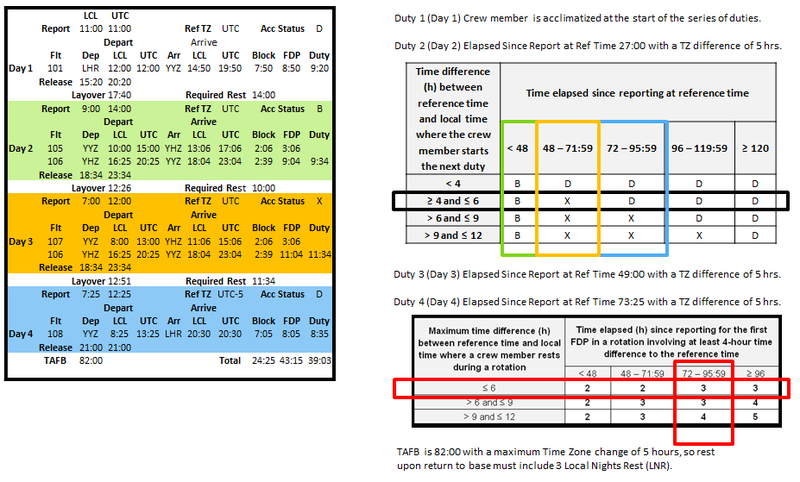 The CM is considered acclimated at the start of the duty period (UTC+2). The Duty ends in Paris(UTC+1). The CM is considered to be in an Unknown state of acclimatisation at the start of the duty period. The Reference time is Still considered to be same reference time as Duty 5. Determine the elapsed time from the first report time of the series of duties to the release time of the series of duty periods. Use the table supplied in CS FTL.1.235 when the greatest time zone difference is greater than or equal to 4 hours. How do you work out your state of acclimatisation and rest requirements after rotations with three or more FDPs, including FDPs in both directions and within the destination time zone? A crew member is considered to be acclimatised to the time zone of the reference time for the first 48 hours. After 48 hours of the rotation has elapsed, the crew member is considered to be in an unknown state of acclimatisation. 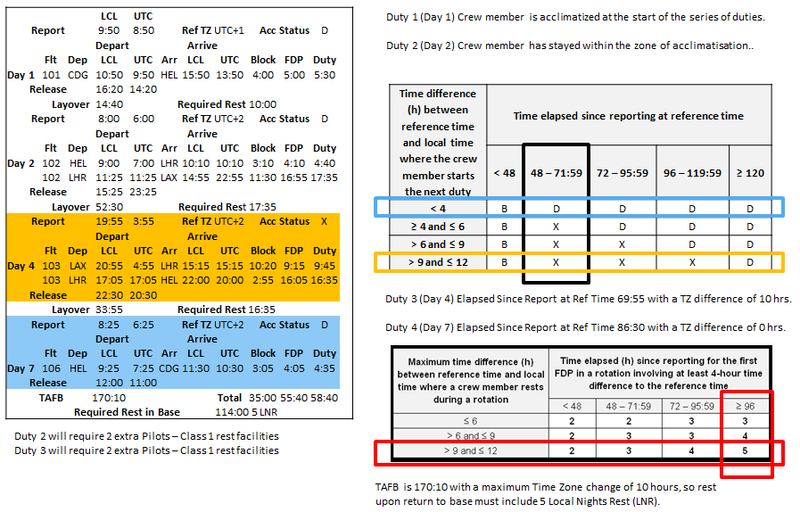 The crew member only becomes acclimatised to the destination time zone if they remain in the first arrival destination time zone (either for rest or any duties) for the time established in the table in ORO.FTL.105(1). been undertaking duties starting at and returning to the time zone of the new location until they becomes acclimatised in accordance with the values in the table in ORO.FTL.105(1). the time elapsed since reporting where they were last acclimatised during the rotation. 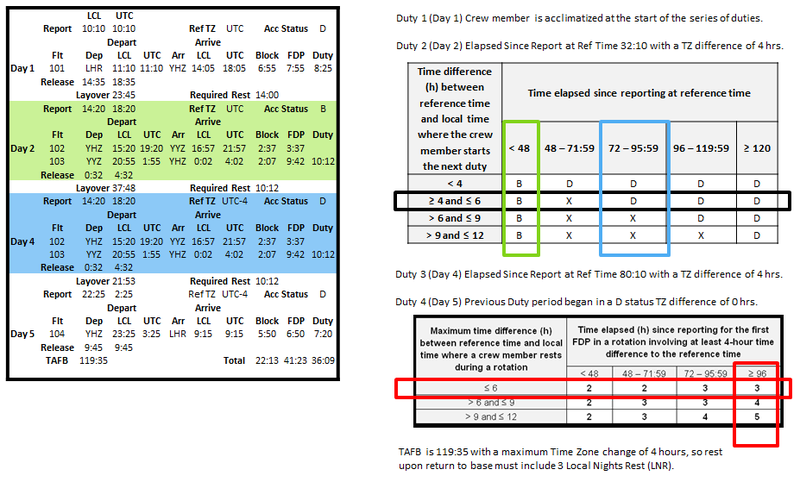 For a rotation with three or more FDPs, use the greatest time zone difference from the original reference time to determine the minimum number of local nights of rest (in accordance with the table in CS FTL.1.235(b)(3)(i)). If such a rotation includes time zones crossings in both directions the calculation is based on the highest number of time zones crossed in any one FDP during the rotation. After 48 hours of the rotation has elapsed, the crew member is considered to be in an unknown state of acclimatisation. 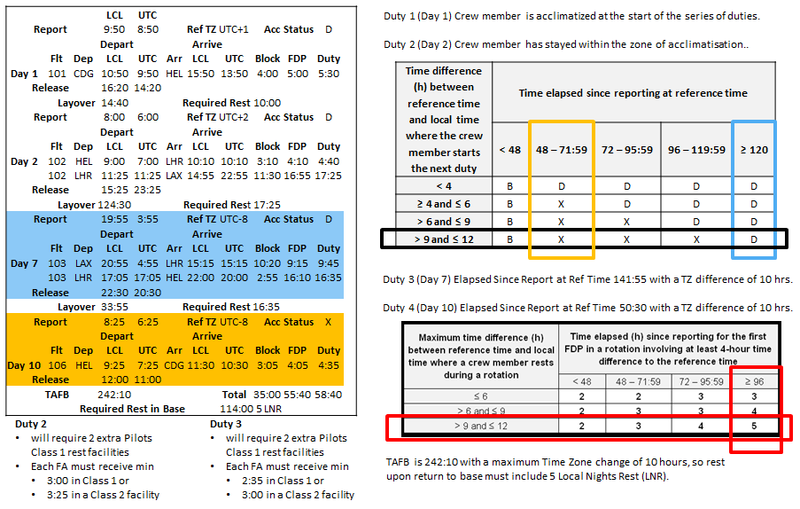 The crew member only becomes acclimatised to the destination time zone if they remain in the first arrival destination time zone (either for rest or any duties) for the time established in the table in ORO.FTL.105(1). Duty Period #3: CM remains acclimated to the time zone of the point of last acclimatised time zone for a 48 hour period. Duty Period #4: CM is considered to be in an unknown state of acclimatization, the CM has not remained in the time zone for the duration prescribed in Table 1 and has not had a rest period since the time of last acclimatisation that meets the criteria in CS FTL.1.235(b)(3). Duty Period #4: CM is considered to be acclimated to the time zone of duty period start as the rest period before meets the criteria in CS FTL.1.235(b)(3).